Very few times will you ever find a band that lasts very long; but Jackopierce is one of the bands that are made up of musicians who just won’t give up. The musicians Jack O’Neill and Cary Pierce have taken their music in several directions over the years. With their new album of Everywhere All the Time, Pierce and O’Neill have created songs that have a very commercial sound to them. With that style, they are sure to make new fans to add to the huge list of fans they already have. With the newest album of music from this musical group, the duo of Jack O’Neill and Cary Pierce seem to take many different approaches to the music on the album. From straight-out acoustic rock to songs with folk influence, the feeling on the Everywhere All the Time album changes from song to song, creating a release that promises something for everyone. Everywhere All the Time starts off with the song “Into Me”. Taking some influence from Jason Mraz and some more of today’s pop/rock artists and bands, the rock song has a sound that has a good groove and will get people moving. After one song with a good groove, Jackopierce creates yet another track with a groove. This time, the song “Finally Free” ends up feeling like the first single of the album. The light feeling of the acoustic and electric guitars combine together with a drumbeat that grabs your attention and won’t let go. The song brings to mind the sound of bands like Vertical Horizon and other pop/rock bands that would fit in on today’s Top 40 radio stations. Taking a chance to create a sound all their own, the song “Around Me Now” by Jackopierce has a stronger rock feel than the previous tracks on the release. While it still has a pop feel that may remind some of songs by Sugar Ray, there’s enough originality in this track to give people something new to listen to. Jackopierce takes a different approach with the song “Listen to Me”. The duo of Jack O’Neill and Cary Pierce create the song with an acoustic feel. The acoustic guitars and keyboards in the background take the listener into a folk state of mind. The song has a very catchy sound that may have you thinking of pop/rock from artists from the seventies. The folk feeling that blends with the acoustic rock on the song helps create a mellow feeling while keeping the catchy melody of the song strong. Sometimes O’Neill and Pierce wear their influences too much on their sleeves; this is definitely the case with the song “Alright By Me”. It is on this very catchy song that the duo brings forward some influence from Blessid Union of Souls into their musical mix. The song about a girl who falls in love with the narrator of the song comes a bit too close to Blessid Union’s best known track “Hey Leonardo“. Though “Alright By Me” could stand on its own if you knew nothing of Blessid Union, for those who do know the band, the connection between the two bands on this song is too obvious; whether O’Neill and Pierce were aware of that connection or not. Jack O’Neill and Cary Pierce let the lyrics of “Let Go of Me” come to forefront of the song. The ability to take a soft rock song and let the lyrics take control is a sign of good songwriting. “Let Go of Me” is one of the best songs as far as the lyrics are concerned. The play between the two vocalists during the chorus of the song creates one of the best choruses on the whole release. And with the accordion in the background, “Let Go of Me” is one of the best tracks on the newest release from Jackopierce. The album stays with a soft rock feel with the next song of “Lonely”. Like the song “Let Go of Me” before, “Lonely” plays with your heart as you listen to the emotional lyrics of the song. Like other moments on the album, “Lonely” feels like it comes from a different era of rock. The beauty in the song brings to mind some of the artists in the 70s. In fact, you might find a little bit of The Eagles in the music to the song. From the pop/rock of “Into Me,” the groove found on “Finally Free,” and the soft rock on songs like “Let Go of Me” and “Lonely,” Jackopierce has created a new release that gives the listener many different styles of rock music on the album. For longtime fans of the band, this is a solid release that should make you happy. For those about to discover the music of the band, Everywhere All the Time’s ever-changing musical style will give you many songs that will fit into your music library. There’s a lot of good music on this release no matter where you fall. 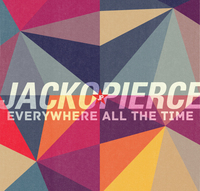 To discover the music of Jackopierce, here is the video to the band’s song “Around Me Now“.